Nu Skin Enterprises, Inc. (NUS) develops and distributes anti-aging personal care products and nutritional supplements worldwide. This dividend achiever has paid dividends since 2001, and has increased dividends for 13 years in a row. The company’s last dividend increase was in February 2013 when the Board of Directors approved a 50% increase in the quarterly distribution to 30 cents /share. The company’s peer group includes Avon Products (AVP), Estee Lauder (EL) and Revlon (REV). 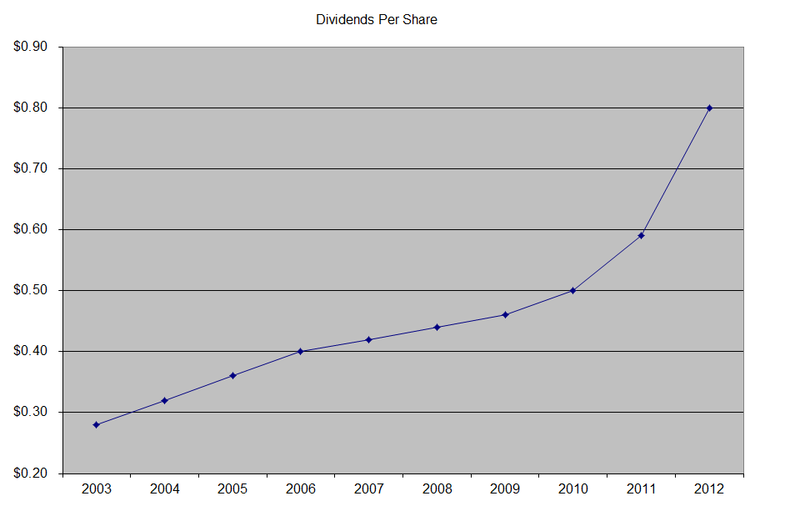 Over the past decade this dividend growth stock has delivered an annualized total return of 14.40% to its shareholders. 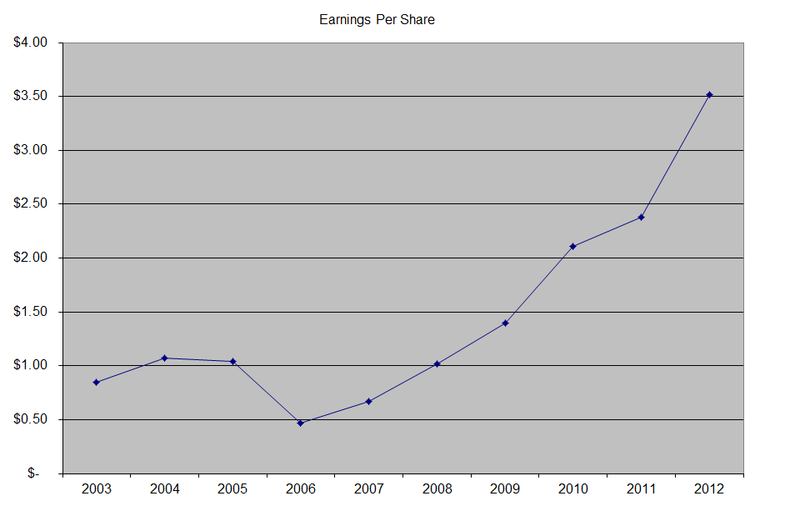 The company has managed to deliver an impressive 17.10% average increase in annual EPS since 2003. Analysts expect Nu Skin Enterprises to earn $3.99 per share in 2013 and $4.50 per share in 2014. In comparison, the company earned $3.52/share in 2012. Over the next five years, analysts expect EPS to rise by 11.40%/annum. The company generates a very high return on equity, which has been on the rise since 2006. I generally want to see at least a stable return on equity over time. I use this indicator to assess whether management is able to put extra capital to work at sufficient returns. The annual dividend payment in US dollars has increased by 12.80% per year over the past decade, which is lower than the growth in EPS. 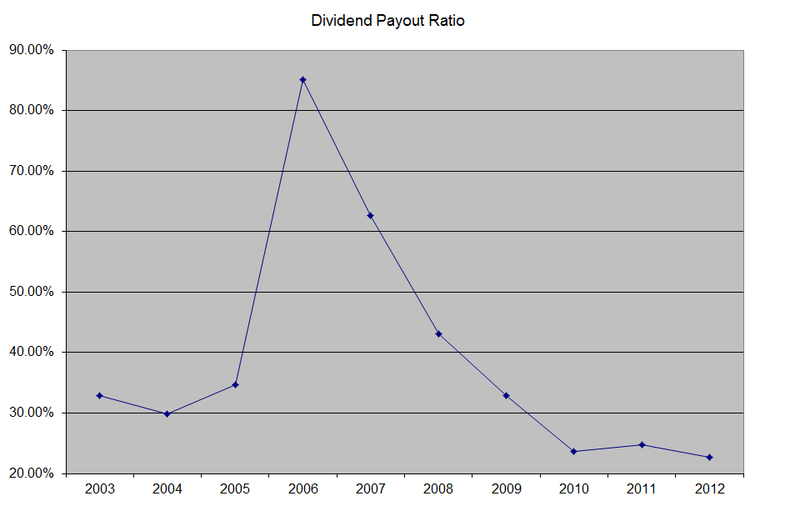 A 13% growth in distributions translates into the dividend payment doubling almost every five and a half years on average. If we look at historical data, going as far back as 2001, one would notice that the company has indeed managed to double distributions every five and a half years on average. The dividend payout ratio has remained below 60% over the course of the past decade, with the exception of a brief spike in 2006 – 2007 period. A lower payout is always a plus, since it leaves room for consistent dividend growth minimizing the impact of short-term fluctuations in earnings. Currently Nu Skin Enterprises is attractively valued at 11.70 times earnings, yields 2.90% and has a sustainable distribution. While the stock is cheap, and seems to have great growth prospects ahead, the lack of competitive advantages makes me pass it at this time.